We rely heavily on our intuitive understanding of communication. 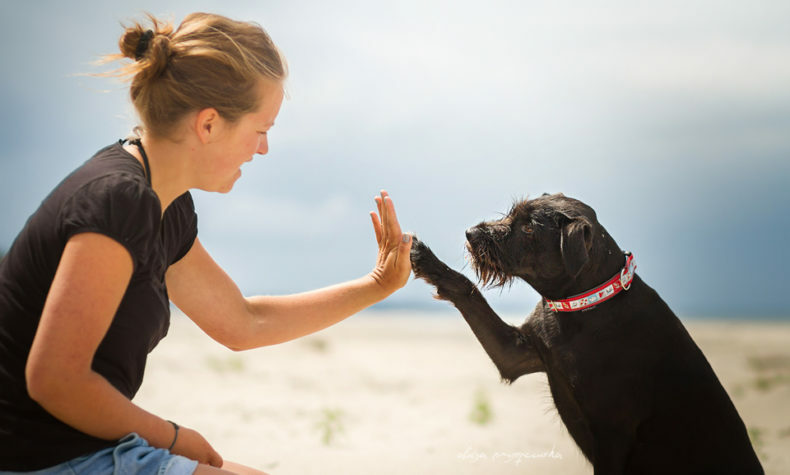 We think that somehow animals will understand what we are saying, in our verbal language. One of the pictures that I have in my head is a friend coming with a visit to my house. Majority of people want to make some interaction with my dogs. It usually starts with asking my dog to give high five or sit. The result is pretty much always the same. My dogs keep wagging their tails and having no clue what they were asked for. What do guests do? The repeat the cue, they ask over and over again usually, they try to change intonation (at the end they ask me why my dogs are not “trained”). Like if there is some magical connection between human and a dog and that if we try really hard, they will understand what we are saying. Our guest behavior is definitely strongly influenced by the history of reinforcement. At some point in their life this behavior was reinforced, usually by accident, when the dog sat after all the talking. Police officers were doing amazing helping seal trapped in a plastic. She was obviously under a lot of stress, not knowing what will happen to her, being constrained and surrounded by people. She was trying to escape, tried biting the officers. They on the other hand, wanted to help and comfort her during the time they were releasing her. So, what did they do? They were talking to her. They were saying “ok don’t worry”, “don’t be scared, it’s OK”. Those are very intuitive things to do. That’s how we humans communicate. I think those examples show nicely how we perceive communication. How we take for granted that other side understands things the way we do. It’s often a source of misunderstandings. Because we may have visualization of how we want things to turn out, but our interlocutor can be in a completely different position. Which often is a case in dog training. We rely on our language a lot. It matters how we speak about things what words do we use. I have recently done a poll on that subject and majority of people use cue instead of command, but I think it is important topic to mention in this article. I consider the training vocabulary important factor of how we perceive dog training. 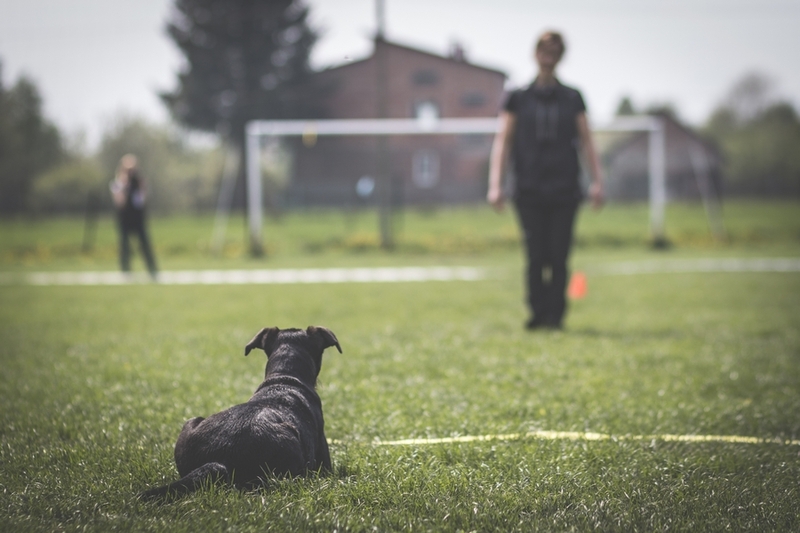 There is a big shift in the dog training world from using “commands” to “cues”. Command is perceived as something that has been done and never refused, has a military, circus, connotation. Cue is rather a hint, a prompt, the dialogue. If we say a cue and our dog doesn’t respond, it is less likely we say we are disobedient. Command had the effect of what some labels have (check behaviorworks.org about labels topic). It was implying certain approach to the learner, usually involving punishment-based methods. What is the function of a cue ? How is all that relevant for dog training? VERY relevant it turns out! We KNOW, step by step, what the expected behavior should look like. We give the cue … and the very opposite happens. But my cue is so obvious and clear, and I know HE CAN DO IT! How many times have you thought that? How many times have you been irritated when the dog did not respond to your cue or responded in a different way than you’d expected? But he KNOWS it! I have in my head what Kathy Sdao once said that in contrast to our learner, we have in our head all the behavior, everything that is about to happen. Lack of clarity and lack of understanding what are the function of antecedents can be a source of errors in training. Do you remember A-B-C contingency? What causes the behavior to appear? So what is a cue? Sd is a change in the environment, which at a given moment increases, (or in the case of punishment, decreases) the frequency of a behavior (or one of its qualities, such as duration, intensity, etc.). Sd has a so-called evocative effect. When a bowl of soup appears in front of you, it is a cue for you to take a spoon and start eating. Sd increases the probability of a behavior occurring at a given moment. The effects of Sd, as opposed to the effects of a consequence, can be observed HERE and NOW. In operant conditioning, stimuli do not appear without consequences. That is why in behavior analysis we have types of Sd as e.g. SD or SdR i.e. discriminative stimulus for punishment or reinforcement. Sd controls behavior through the history of differentiated AVAILABILITY of a given consequence (punishment or reinforcement). A CUE informs our learner that at this moment, in this context, reinforcement is AVAILABLE for the behavior. As opposed to MO, (motivating operations, which are also stimuli preceding a behavior) which inform about the VALUE of the reinforcement or punishment, not just their availability. Why are you not answering the phone at this moment? (I assume you aren’t) Because it’s not ringing. This is what we call stimulus control. Why does your dog not circle any cone ore tree in sight? Because there’s no stimulus which might inform him about the availability of reinforcement for this behavior, right then. The cue tells our learner that reinforcement is available, because in the past, in these or similar circumstances, this behavior resulted in reinforcement. What is the likelihood of your dog starting to bring you a scent article in the middle of the night? Probably negligible. Why? Because there is no stimulus to inform him that reinforcement is available for this behavior. And what is the probability that he will bring you a scent article when you are in the training venue? Surely much higher. All this information will be useful for analyzing our repertoire of cues. We have to remember that it is the learner who picks the relevant stimuli. Even if to us it seems that something is a cue, it may well not be. It can only be verified by the behavior of our learner. Do we really want perfect stimulus control? Rarely. The truth is dog training relies a lot on the environment cues. When I say box while my dog is in his bed or while I’m scratching him, the chances that he will stand up and run in the search for obedience box are pretty low. Same when I say distance control cue while my dog is walking on the leash, on the street. This is perfectly fine for me. I don’t need them to respond out of context. We humans have few behaviors under perfect stimulus control either. Lets even talk about our name. Do we respond to our name in every occasion we hear it? Not likely. When I am in a crowd and someone says my name far away from me, I won’t respond. It would be different if someone said my name standing next or just behind me. One of the behaviors I consider to be under strong stimulus control is picking up the phone when it rings, when we have specific ringtone. Anytime I hear “Bad things ” by Jack Everett I want to pick up my phone. Even when it’s just True Blood straining on the screen, I catch myself checking my phone if it rings. Why? Because when I heard that song there was a consequence available – conversation. What do we have to remember when choosing cues? the cue should be consistent. We can’t expect our learner to respond to a modified cue. We frequently try to introduce stimulus discrimination, while at the same time we modify the cue, saying “heel” on one occasion and “heeeeeeeeel” on another. It doesn’t matter what they mean. They will acquiring meaning after operant conditioning takes place. I have many abstract cues. My sit from stand cue “GRZMOT” literally means “Thunderstorm”, but for my dog it evokes sit with front anchored behavior. Don’t assume that if you call a behavior by a word that has a meaning it will make your dog understand it. I think it’s similar to our long cues issue. There will be a certain part of the cue our dog responds to, part that is relevant. Make sure you are aware of environment cues. Make sure you know what is the Sd for your dog. It rarely is just one stimulus. Be aware of that and it will help to avoid misunderstandings. Dogs pick out really tiny things from the environment, they are a wonderful observers and learn the context quickly. Verbal, visual, tactile. Which is better? There is no general better here. It’s more abut which one will stand out in the specific environment. Can I use a visual cue for recall. Sure but what will I do if I want to call my dig and he is turned back to me? In the next part of this article we will cover how to add cues, watch some videos examples and analyze why things go wrong sometimes.